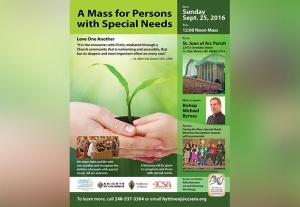 All are welcome to St. Joan of Arc Parish in St. Clair Shores for the annual Mass for persons with special needs, their caregivers, and loved ones on Sunday, September 25 at 12:00 pm. Bishop Michael Byrnes will be the main celebrant, the annual Special Needs Ministries Recognition Awards will be presented, and a special blessing provided. Refreshments follow. Learn more by Downloading the Flyer or contact Joyce Hyttinen by calling 248-537-3304 or email: hyttinenj@ccsem.org.